Canada voted to change governments just a year before the United States did and the countries are taking more divergent policy tracks than at any time since Pierre Trudeau warned Ronald Reagan that his proposed missile defence system was destabilizing. (It was, in the sense that the Soviet Union collapsed, the Cold War ended, and there was only one superpower left in the world.) All indications from both governments are that the NAFTA free trade talks are not going well. It is time to recognize that Canada got a very good deal in free trade with the U.S., thanks in large part to the very high esteem then-prime minister Brian Mulroney earned with president Reagan and president George H.W. Bush. He was widely criticized at the time for being a White House lap dog, but in fact, he recognized that with the United States at the height of its preeminence in the world, the only way for Canada to have any influence was to be taken seriously by Washington. Mindful of the problems between Trudeau and Reagan, and of the domestic political backlash against Mulroney's popularity in the White House, Jean Chrétien was correct but not close with the Clinton administration, and visited 34 capitals before he got round to Washington. But Clinton graciously demolished the separatist argument at a conference on federalism that Chrétien convened at Mont Tremblant in October, 1999. Stephen Harper also had correct but not at all intimate relations with Washington. Justin Trudeau and Barack Obama seemed to be soulmates: they were both environment crusaders, traditional believers in redistributing money, and doffing their caps at anything that was politically correct, ever on the lookout for new categories of victims to identify and reward. The prime minister has enjoyed an extended political honeymoon, but after 27 months, there have been few substantial policy initiatives, and $40 billion of federal deficit spending (more than double what had been forecast). In the United States, as all Canadians know, the Trump administration was elected promising a scorched earth war on the entire preceding political system: all factions of both parties, the lobbyists, Wall Street, and the politically meddlesome entertainment industry. Trump promised lower and simpler taxes, deregulation, environmental protection but with no credence attached to claims of climate change, let alone global warming, and renegotiation or withdrawal from trade deals that were net losers for the United States. There would be no more appeasement of North Korea and Iran, and no more foreign nation-building either. America's so-called allies would be invited to pay their promised share of alliance defence costs or contemplate dropping out from under the U.S. defence umbrella. The two leaders could scarcely be more different temperamentally or ideologically, though they seem to get on well personally. Trudeau, the emollient charmer, has enjoyed a long honeymoon. Trump, who stormed Babylon, spitting fire and swearing to "drain the swamp" and revive the flat-lined economy, is still at war with the remnants of the Bush-Clinton-Obama regimes. Where Trudeau has not been legislatively ambitious, Trump has produced comprehensive changes in tax and immigration policy, general deregulation, and an about-face on environment and energy production, and radical change in health care. It has been a tumultuous time in which his enemies, which include most of the American media, have bandied about presidential impeachment for collusion with a foreign power, violation of the 219-year old Logan Act for unauthorized attempts to conduct foreign policy, various imputations of obstruction of justice, and recourse to the 25th Amendment of the U.S. Constitution, under which the vice-president, the majority of the cabinet, and two-thirds of each house of the Congress can suspend a president for physical or mental incapacity. It is all nonsense, but it has been a diverting spectacle. The Republicans in Congress have fallen in behind him and he has had the most successful first year after his inauguration since Eisenhower, if not Roosevelt. The Democrats are starting to sound a little more like a loyal opposition. Trudeau ran a gracious and polite campaign for humane change, without having any swamp of massive discontent to drain. Economic growth in the United States has produced two million jobs in Trump's first year and economic growth may reach four per cent this year, meaning that there will be no reduction in the still-large gap between the size of the American and Chinese economies for the first time since the great Chinese economic drive began 35 years ago. In Canada, economic growth is forecast by the Finance ministry and the Bank of Canada at 2.1 per cent this year and 1.5 or 1.6 per cent next year. About 10 per cent of the entire Canadian population consists of public-sector employees, compared to under seven per cent in the U.S., despite that country's immense armed forces, and in Canada, public-sector pay scales are 11 per cent above the private sector. According to the Fraser Institute, despite federal government claims to the contrary, 81 per cent of Canadian middle-class families and 60 per cent of lower-income families (and 100 per cent of higher-income earners), are paying higher taxes than they did two years ago. Seven of 10 provinces have top income tax rates above 50 per cent, and when HST (13 per cent in Ontario) and other taxes are added, more than 70 per cent of the income of most professionals, executives, and skilled workers goes to taxation. This is a policy of high economic and political risk. Canada needed a rest from the tired, autocratic, toe-curlingly serious Harper regime. But the present federal government is courting disaster with a flower-child benignity of incentivized victimhood, feel-good jolly progressivism, and unctuous, indiscriminate appropriation of income from those who earned it to those who haven't. 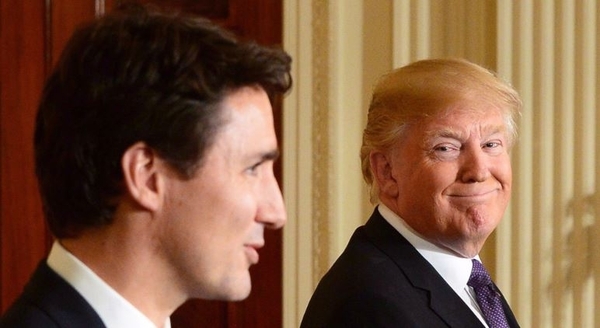 Continuation by the U.S. and Canadian governments on their present courses will revive the brain drain and bring the Trudeau honeymoon to a rending stop, as a Trump honeymoon finally begins.